Dr. Grehan is a University (Research) Fellow in the discipline of Earth and Ocean Sciences, School of Natural Sciences, at the National University of Ireland, Galway. Dr. Grehan obtained his PhD in Zoology in Ireland before undertaking post-doctoral studies at the Université Pierre-et-Marie-Curie, Paris VI (Laboratoire Arago, Banyuls) and at the Université du Québec in Rimouski and Montreal, Canada. This work primarily focused on benthic mapping/monitoring and environmental assessments of estuaries, embayments and coastal seas, and of hydrothermal vent and seep areas, in the deep-sea. Dr. Grehan over the past 15 years has focused his research efforts on the mapping/characterisation, habitat suitability modeling, identification of impacts and conservation of cold-water coral reefs and the sustainable management of deep-sea resources in general. He is former chair of the Irish Coral Reef Task Force - a cross sectoral forum - that brought the need to conserve Irish coral reefs to the attention of the media and policy makers in Ireland. This ultimately paved the way for Ireland to be the first country in the European Union to protect cold-water coral reefs under the EU Habitats Directive. 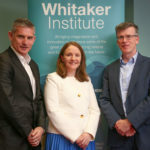 Dr. Grehan has developed a keen awareness of policy matters and has co-authored legal and socio-economic papers addressing important aspects of sustainable development. Dr. Grehan has 20 years of experience working in European funded marine projects and recently coordinated the 11 country, large integrating EU FP7 project: 'CoralFISH' - Ecosystem based management of deep-sea corals, fish and fisheries (www.eu-fp7-coralfish.net). Dr. Grehan is currently a work package leader in the H2020 project ATLAS - A Trans-AtLantic Assessment and deep-water ecosystem-based Spatial management plan for Europe (http://www.eu-atlas.org); is co-work package leader in the H2020 project Merces  Marine ecosystem restoration in changing European Seas (http://www.merces-project.eu); and is a member of the NUI, Galway team participating in the H2020 Ocean Literacy project: Sea Change - Our Ocean Our Health (http://www.seachangeproject.eu). Dr. Grehan is a member of the International Council for the Exploration of the Sea (ICES) working groups on Deep-Sea Ecosystems and Marine Habitat Mapping and has chaired an EC Scientific, Technical and Economic Committee for Fisheries (STECF) working group evaluating the effectiveness of marine protected areas as tools in fisheries management. In 2009 he was invited by the French Department of Ecology, Energy, Sustainable Development and Spatial Planning, as an international expert to participate in a Commission examining the long-term sustainability of the French deep-sea fishing industry. He recently completed a review of European funded climate change research in the NE Atlantic as part of the EU FP7 CLAMER project. He has contributed to a number of European research foresight reports. Dr. Grehan has been an EC expert evaluator during the last three framework programmes: FP5, FP6 and FP7 and recently acted as an FP6 project reviewer and has reviewed scientific papers for numerous scientific journals, books and conference proceedings. Dr. Grehan is an active sea-going scientist, participating in c. 20 full-ocean going expeditions including 10 ROV/submersible expeditions and has been chief or co-scientist on four recent Celtic Explorer expeditions in 2005, 2009, 2010 and 2015. Marine benthic habitat mapping; marine benthic habitat suitability modeling; deep-water coral ecology and conservation; marine protected areas; marine spatial planning; sustainable ocean resource management. (2009) Marine Monitoring Platforms: Paradigms for Development in Ireland. (2012) Impacts of Climate Change on the North-East Atlantic. (2011) Report of an international scientific workshop: the impact of deep-sea fisheries and implementation of the UNGA Resolutions 61/105 and 64/72. (2010) Science dimensions of an Ecosystem Approach to Management of Biotic Ocean Resources (SEAMBOR). (2006) Biological and ecological aspects of Lophelia pertusa relevant to the establishment of Marine Protected Areas. (2004) Cold water corals: out of sight - no longer out of mind. (2003) The Irish Coral Task Force and Atlantic Coral Ecosystem Study: Report on Two Deep-Water Coral Conservation Stakeholder Workshops Held in Galway in 2000 and 2002. (2000) Biodiversity in the deep-sea. (2001) Conserving deep-water corals within offshore areas under Irish jurisdiction. Workshop convened by the European Commission and German Federal Government for Legal and Scientific Experts from 15 countries and scientific institutions, International Academy for Nature Conservation. (2011) Coupled hydrodynamic-sediment transport modelling in Galway Bay, West of Ireland: Sediment mobility of maërl habitats. (2012) Using EUNIS habitat classification for benthic mapping in European seas: Present concerns and future needs. (1986) Population dynamics of the ampharetid polychaete, Melinna palmata Grube, in Inner Galway Bay, west coast of Ireland. (2012) Cold Water Coral  Managing a Valuable Resource.